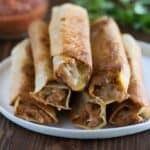 Crispy Bean and Cheese Burritos are guaranteed to be family approved, and perfect for an easy weeknight meal. They include seasoned refried beans and fresh shredded cheese layered inside a tortilla and cooked until crispy. Add the refried beans, salsa, chili powder, garlic powder and cumin to a mixing bowl and stir until smooth. Spoon about three tablespoons of the bean mixture onto the center of a flour tortilla and smooth into a thin layer. Sprinkle with a large pinch of shredded cheese. Roll tightly. Repeat with remaining tortillas. Heat 1-2 tablespoons of oil in a large saucepan over medium-high heat. Place a few burritos, seam side down, into the pan. Turn them every 30 seconds or so as they cook until they are golden and crispy on all sides. Serve warm, with homemade five-minute salsa and guacamole, for dipping.